Timeline is generally a part (usually the right one) of a Gantt diagram of both types. It shows processes durations (time periods), events with no duration (milestones) and connector between them, of which a whole task consists. Also there are a couple of elements that help you to navigate through the timeline. Timeline of a Project Chart is rather different from a timeline of a Resoure Gantt due to their different purpose. Later in this article we will look at both of them and consider that difference. You can look up the Resource Chart article to know more about managing Gantt Charts of this type. You can look up the Project Chart article to know more about managing Gantt Charts of this type. Look at the samples or pictures of both Gantt diagram types. You can notice vertical borders on both types. These borders in the Data Grid part and the one that separates Data Grid and Timeline parts are splitters. They can be dragged: when you hover over those splitters, you will how a mouse cursor will become of a typical kind for dragging. Let's make a couple of samples with these markers. First of all, let's create 2 line markers: one showing the current date and second one - the date when the ongoing process should become finished. As you see, we can define some parameters of each linemarker such as color, dashes or thickness using stroke() method. It is used absolutely the same way as any other line settings with the stroke() method. Now, look at the sample with a textMarker showing the planned finish date and a rangeMarker showing the remaining time. You might have noticed, that we used values of enumerated type in those samples above as a point in time. There is a list of enums that we can use to place the markers. Let's look at them. "start" The first time point in the Gantt diagram timeline. "current" The current time point in the Gantt diagram timeline. "end" The last time point in the Gantt diagram timeline. There are three special values for setting to the text markers' value() method: "start" and "end" to the range markers' from() and to(). The value returns the current date, start - the start date of the gantt chart timeline and end return the end date of the whole Gantt diagram. Despite being quite different in usage and purposes, markers behave identically when it comes to coloring, positioning and shaping them. We use fill() method to color a range markers, stroke() to color the line markers; for text markers we use standard markers as well. We should format the objects passed to these methods as usual. There are some methods inherent to the timeline only. 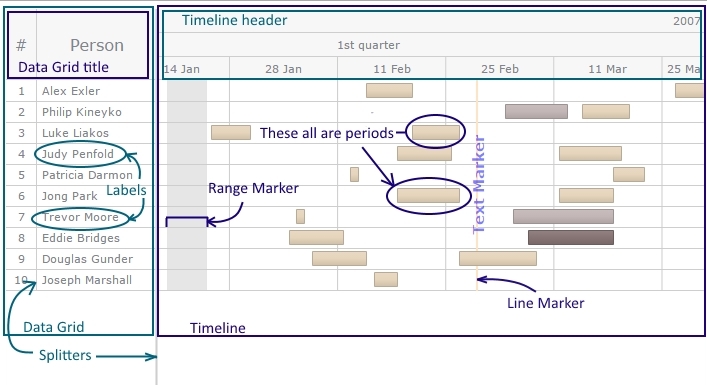 You can see a table below with all timeline methods which can be used to change the color scheme of your Gantt diagram. There are two ways of defining colors and other visualization parameters: through those methods as usual or through the data while setting it. Using dataset to define some visualization settings gives you more flexibility as you can affect each data point separately, while methods act on all elements of each type together; also, we can affect only data points when we use the dataset. Let's try to create a couple of samples using both these ways. Below you can find a sample of a Resource Gantt Chart where we set the rows' colors using rowEvenFill(), rowOddFill(), rowHoverFill(), rowSelectedFill() methods, the selected elements' colors using selectedElementFill() and selectedElementStroke() and change some data points' colors through the dataset. Now, let's look at the Project Gantt Chart with parameters adjusted the same way. Here we made the milestones using milestoneFill(), milestoneStroke() and connnectors (with connectorFill() and connectorStroke() methods) of the custom colors, as well as some of the data points, using the dataset.